JUST ONE YEAR REMOVED FROM WISCONSIN BEING NAMED a territory in 1836, the first settlers arrived in Pine Bluff. That summer of 1837, they started a long procession of families looking to escape famine and political oppression in their homelands. They wanted a better way of life. They arrived from places like Tipperary, Meath, Goetzenkirchen, Neunkirchen, Cologne and Lanarkshire. For nearly two decades before the establishment of the area’s first Catholic church, these pioneers built log homes and productive farms that dotted the landscape around Pine Bluff. They planted their feet, their homes and their crops, yes, but also set the Cross of Christ in the maiden territory of Dane County. Edward Campbell, the manager of a gold mine from Louisa County, Virginia, was the first to claim a stake in Pine Bluff. On August 28, 1837, he purchased three 80-acre tracts in Sections 26 and 27 of what later became known as the Town of Cross Plains. He paid $1.25 per acre. Campbell preceded his Scottish-Irish parents to America from the family home at Lanarkshire, about halfway between Glasgow and Edinburgh, Scotland. His wife Sarah’s father, William Walton, was owner of the Walton Gold Mine. Edward Campbell of Pine Bluff operated a general store near the village square in Madison. After securing his Wisconsin land, Edward Campbell returned to Virginia to get his family. Edward, Sarah Arrington (Walton) Campbell and their three daughters made the long trek to Wisconsin in a covered wagon with a cow in tow. Sarah’s mother wept at their departure: “Now I shall never know where my child’s bones lie!” Shortly after arriving back in Dane County, Edward purchased another 160 acres of land, adding to holdings that by 1840 totaled 400 acres. In June 1838, Edward and his brother Hugh welcomed their parents, John and Mary Campbell, along with four siblings and two future brothers-in-law. Only one month prior, the group arrived in New York City after a cross-Atlantic trip from the port of Greenock, Scotland. The family set to building an eight-room stone house that over the years became a popular stopping point for travelers on the road from Madison to Mineral Point. The sturdy structure had stone walls 20 inches thick. The Campbells, with help from around the region, raised a large frame barn — one of the first in all of Dane County. Edward Campbell’s brothers, Hugh and John, both established farms along what is now Highway S (Mineral Point Road). The brothers primarily farmed wheat. For a time, Hugh was postmaster of Pine Bluff. Hugh and his family became parishioners at St. Mary of Pine Bluff. Edward and Sarah were Protestants. The family patriarch, John Campbell Sr., died in July 1849. His wife, the former Mary Lunny, died in March 1850. Family history suggests that Mary (Lunny) Campbell was a devout Catholic, as the family summoned for a priest to come to her deathbed. Author Bob Buege, in his book, Pine Bluff: A Crossroads in Wisconsin, says the senior Campbells were likely buried in the woods on the Edward Campbell farm in Sections 26 and 27 in the Town of Cross Plains. John Campbell Jr. died in mid-October 1849, and was buried under two old oak trees on Edward’s farm. Edward Campbell moved from Pine Bluff to Portage in Columbia County, where he died on August 3, 1854. The family history contains a moving narrative of how Edward, knowing death was near, summoned his children to his bedside to offer them encouragement. As he lay dying, he shook the hands of each of his employees. His wife wrote home to Virginia, “I think he hurt himself by working too hard.” Sarah Campbell, stricken with similar intestinal symptoms as her husband, died on September 23, 1854, leaving the six Campbell children orphaned. Although they could have come back to Pine Bluff, the children returned to Louisa County, Virginia, to be raised by their Walton grandparents. Hugh Campbell eventually left Pine Bluff to establish a farm near Elk Mound in Dunn County. 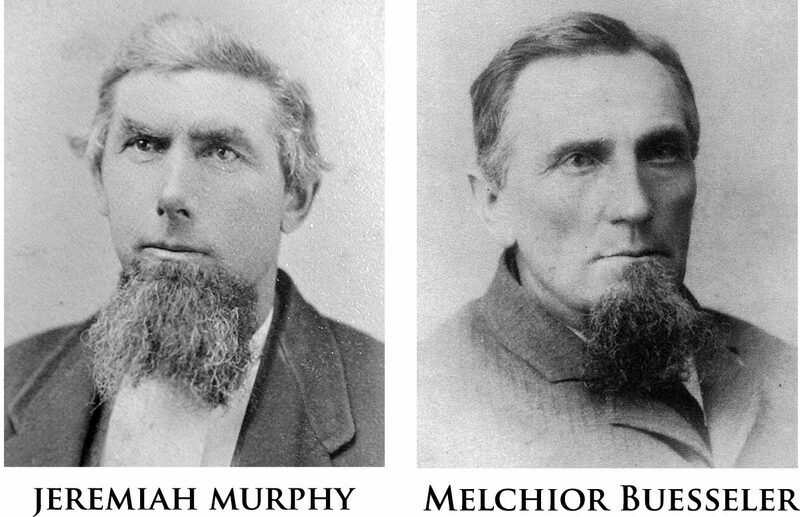 Jeremiah Murphy was one of nine Murphy brothers to come to Pine Bluff in the 1850s. Melchior Buesseler served as a parish trustee. It’s easy to see why this part of Wisconsin was so attractive to these early pioneers. Known as the Sugar River Valley, the southern part of the Town of Cross Plains presented incredible vistas. “A more beautiful and fertile spot than this it would be difficult to find,” read the mammoth 1,300-page History of Dane County Wisconsin, “when viewed from the outlying bluffs and ridges, it presents a delightful picture of undulating prairie farms and woodlands, intersected by a stream from which it derives its name.” Pine Bluff got its name from a rocky ledge that was home to a grove of mountain pine trees. Henry Winkel, an early St. Mary parishioner, described the area this way: “From the highest part of this ridge, on the Mineral Point Road, we have one of the finest landscapes presented to our view that can perhaps be found anywhere in our state, taking in the beautiful valley in which the headwaters of the Sugar River rise.” Winkel operated a mercantile store near the corner of Highway P and Mineral Point Road. He was longtime postmaster in Pine Bluff. He is buried in the St. Mary cemetery. John and Theresia Kalscheur hosted the first Mass in Pine Bluff at their homestead in the fall of 1852. Father Maximilian Gaertner often stayed with the Kalscheurs when he came to Pine Bluff to minister to the people. In early 1847, the Wisconsin territorial legislature established the Township of Cross Plains, then known as Town No. 7 (north of range 7 east). Cross Plains township was bounded by the towns of Berry on the north, Springdale on the south, Vermont on the west and Middleton on the east. After the Campbells established their compound, more settlers put down roots around Pine Bluff. Families with surnames including Bell, Birrenkott, Buesseler, Carden, Coyle, Dunn, Farrell, Howery, Kalscheur, and Quigley, among others. An Irish settlement grew up just west of Pine Bluff beginning in 1845. Pine Bluff and surrounding land became home to a group of Howerys, David Carden, Michael Quigley, Thomas McAuley, William Brennan, several Farrell families, and nine Murphy brothers, among others. German settlers began arriving in 1848, led by Wilhelm and Catherine Loehrer, Peter and Mary Paltz, John and Theresia Kalscheur, and Adolphus and Gertrude Birrenkott. 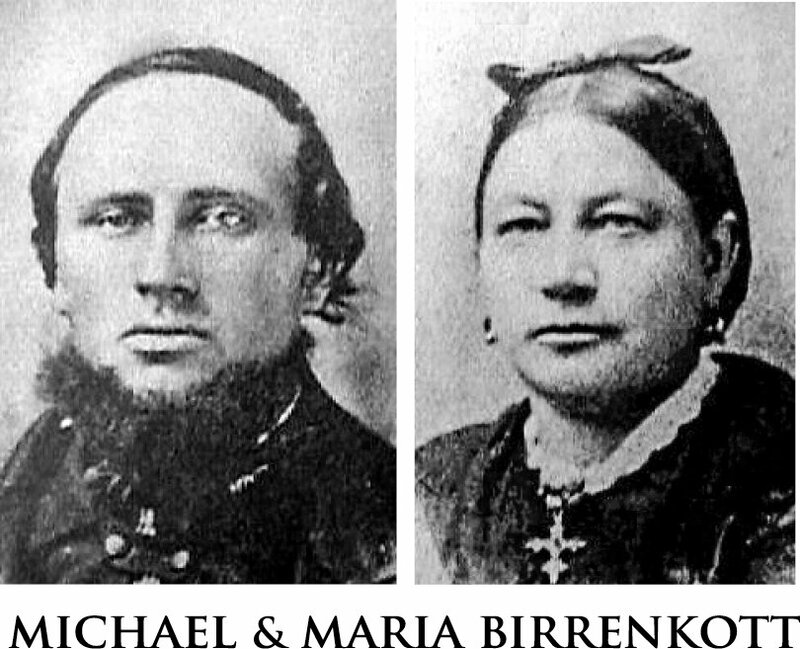 The Birrenkotts settled on 120 acres in Section 28 of the Town of Cross Plains in 1852, after emigrating from their home near Cologne, Germany (the region was then known as Rhenish Prussia). Other parishioners came from the townships surrounding Cross Plains. The Wisconsin Democrat carried the tragic news of Martha Campbell’s death. 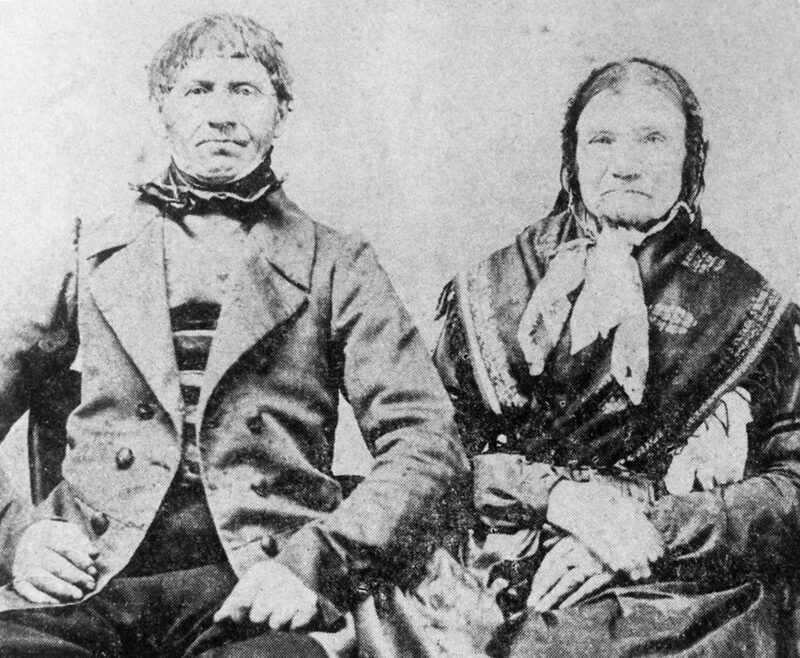 These early pioneers faced many hardships in their new lives. With no Catholic church of their own, they were without the grace of the sacraments or the comforting presence of a priest. This was tragically evident in late March 1843, when one of Edward and Sarah Campbell’s twin daughters died in from fire at the Campbell home. Martha Ellen, 5, was alone in her room when her clothing caught fire. Before anyone could lend assistance, she was badly burned. She died nine days later. Rev. Martin Kundig built nearly 100 altars for pioneer Wisconsin churches, and obtained land near the Capitol for St. Raphael Catholic Church. At the time, there were only about six Catholic priests serving all of Wisconsin and eastern Minnesota. Rev. Samuel Mazzuchelli, who came to America from Italy in 1828, began his missionary work in Wisconsin at Green Bay in May 1831. In February 1835, he traveled to Mineral Point and Prairie du Chien, causing a sensation throughout the mining region. Rev. 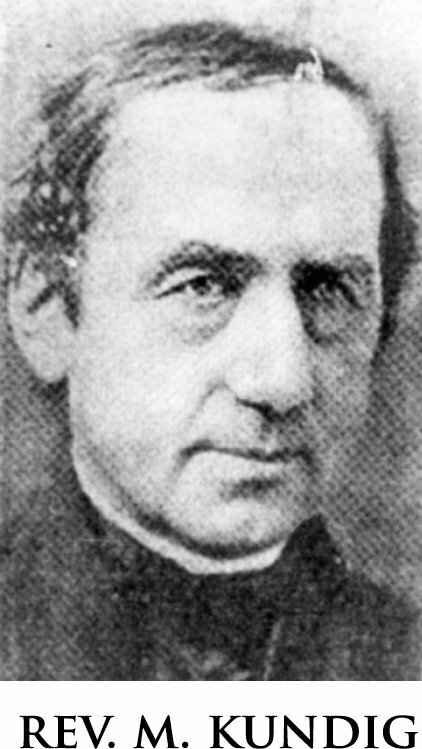 Martin Kundig was sent to Wisconsin by Bishop Paul Lefevre of Detroit in the early 1840s. Traveling by horseback, Kundig ministered to the far-flung Catholics of southern Wisconsin. During just six months in 1842, he established nearly 20 congregations. During his missionary travels, Kundig built more than 100 altars for use in new Catholic churches. On February 8, 1843, Father Kundig preached a sermon in the Council Room of the state Capitol to a “numerous and attentive audience,” reported the Wiskonsan Enquirer. It was said by the Enquirer to be the first sermon ever preached in Madison by a Catholic priest. Father Kundig said the first Mass in Madison on August 15, 1842 at the home of James Sullivan. Kundig had secured two acres of land near what is now the Capitol Square for construction of a church. Trustees advertised their need to purchase 100,000 bricks, 100 bushels of lime and 1,200 feet of hewn timber. The structure, rebuilt a number of times over the years, was to be named St. Raphael’s Catholic Church. In 1846, Inama welcomed a fellow Norbertine from Tyrol, Rev. Maximilian Gaertner, O.Praem., who was based at the missionary church at Roxbury. St. Norbert Catholic Church recorded as many as 100 baptisms each year, serving families from all over the region, including the towns of Cross Plains, Berry and Springfield. After completion of St. Raphael’s, many families from the area then made the long trip to Madison for Sunday Mass. In the fall of 1852, Rev. Fr. Inama offered the first Holy Mass in Pine Bluff, at the home of John and Theresia Kalscheur. The Kalscheurs arrived in Dane County and purchsed their farmstead in September 1852. Rev. Father Gaertner made regular trips to Pine Bluff and the village of Cross Plains, often staying at the Kalscheur home. On October 29, 1853, he came to the Kalscheur home, then walked to Cross Plains and offered Mass. In early December 1853, Father Gaertner had dinner at Kalscheurs, then gave two hours of catechism instruction to 60 children. He then baptized 4-day-old Catherine Berg, daughter of William Berg and the former Anna Marie Virnig. The next day, six people received Holy Communion at the Kalscheur home. In February 1854, Father Gaertner made the four-hour trip from Madison to Pine Bluff in Kalscheurs’ sleigh. He baptized little Francis Coyle. The terrain and weather made being a pioneer priest a sometimes dangerous vocation. One day he went on a sick call with Jacob Kalscheur. It was snowing as the men and their horses made their way down to the valley. There were no tracks to follow and the horses slipped, upending the sleigh and tossing the men into the snow. They eventually reached the ailing man’s house, and Father Gaertner heard his confession and gave anointing of the sick. 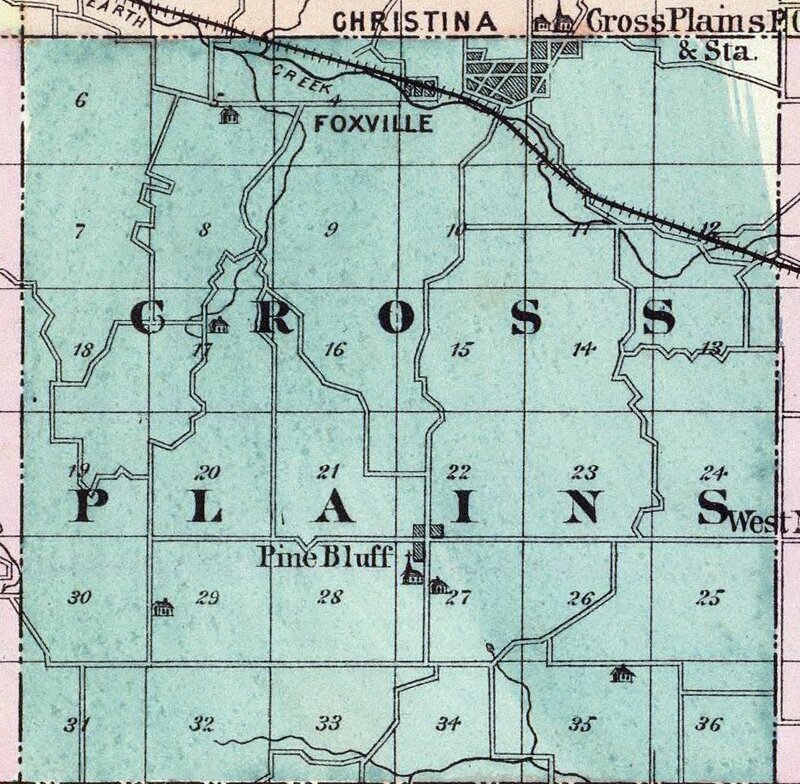 This 1878 map shows the locations of St. Mary of Pine Bluff in Section 27 of the Town of Cross Plains, and St. Francis Xavier Catholic Church to the northeast in the village of Cross Plains. On February 14, 1854, Christian and Gertrude (Scholl) Billstein deeded five acres of land to Bishop Henni for a Catholic church in Pine Bluff. The Billsteins had just settled in Pine Bluff after emigrating from Cologne, Germany in 1853. Christian, a student of history and literature, could spontaneously recite the poems of Friedrich von Schiller and Henry Wadsworth Longfellow. He was also an accomplished poet himself. The family farmed the land around St. Mary for 26 years before leaving the area for Minnesota, where Christian died in 1908. Mrs. Billstein died in Pine Bluff on January 22, 1862. The day after the Billsteins deeded the property, Father Gaertner baptized two of Hugh and Celinda Campbells’ sons, Benjamin Franklin Campbell and George Washington Campbell, ages 3 and 2. The toddlers put up quite a ruckus during the baptism, resulting in a stern reprimand of the parents by Father Gaertner. In contrition, the couple pledged to improve the family’s practice of the faith. On March 13, the first parish meeting was held, resulting in a vote to construct a church 30-by-20-by-14 feet. Logs for the structure were cut into lumber during April. In June, a building commission was elected, with three Germans and three Irishmen: Adolph Birrenkott, John Kalscheur, Herman J. Ploog, Edward Coyle, Michael Quigley and James Farrell. In July, the construction contract of $28 was let to Engelbert Rueland. The parish paid cash for the construction, with each family being assessed $1.25. The first church was located on what is now part of the cemetery. Finishing on the inside was a labor of love by the parish. The communion rail was built by Christian Billstein and John and Jacob Wallraff. The ceiling was done by Jacob Korth. Father Lorenz Conrad donated pictures of the Blessed Virgin Mary. A priest from Berrenrath at Rhine, Prussia, sent eight beautiful vestments. 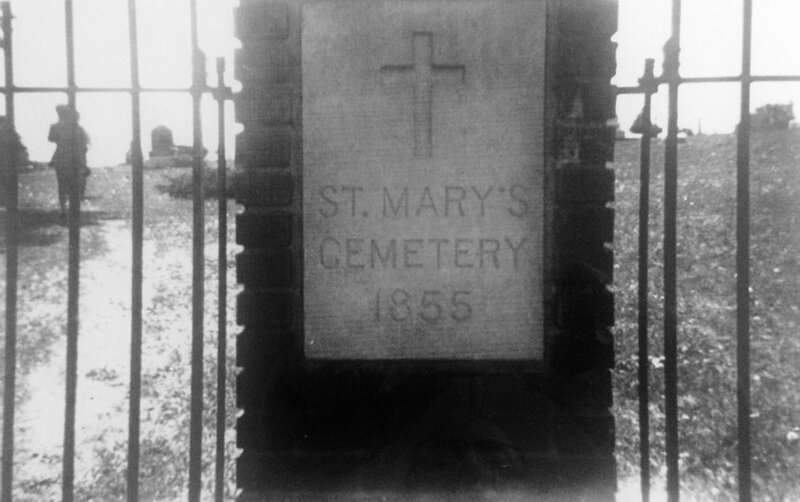 St. Mary Catholic Cemetery was consecrated by Father Maximilian Gaertner on August 15, 1854. A fence was erected later. Despite that ignorance, the newspaper defended the Church from the hate directed at it by the Know Nothings, a political movement that aimed to keep Catholics and those of foreign birth from public life in America. “If the Know Nothings, and others who have such a holy dread of Catholicism, would exert themselves to promote the education of the masses and the more general pursuit of scientific knowledge, instead of forming secret societies and ranting about Catholics and foreigners, they might accomplish something,” the paper wrote in the same article. At 10 a.m., rifle shots announced the start of the dedication service. Father Gaertner, accompanied by a cross bearer, two servers with candles and four banner carriers, came from the church to meet the parishioners near the foot of the hill. Two youths stepped forward to greet Father Gaertner with short German verses composed by John Kalscheur. When we leave our earthly home. The elder Kalscheur, who was known to family and neighbors as “Papa,” delivered words of welcome that brought Father Gaertner to tears. The procession then moved up the hill to the church with Father and the people praying the Litany of the Blessed Virgin Mary. Kneeling at the foot of the altar, Father Gaertner prayed three Psalms: Laudete pueri, Laetatus sum, and Lauda Jerusalem, followed by the Oratio pro paramentis. His sermon that morning, given in English and German, talked of the value of the new church; poor in external appearance yet rich in grace internally. He urged the faithful to make themselves worthy of this grace through zeal, sacrifice, recollection and a quiet life befitting a Catholic. After the church dedication, Father Gartner presided over the marriage of Maria Clara Kalscheur and John Michael Birrenkott. He also baptized the children of Christopher Campbell and Patrick Codman. Finally, Father Gaertner consecrated the cemetery adjoining the church. This now holy ground had already received the bodies of two children. 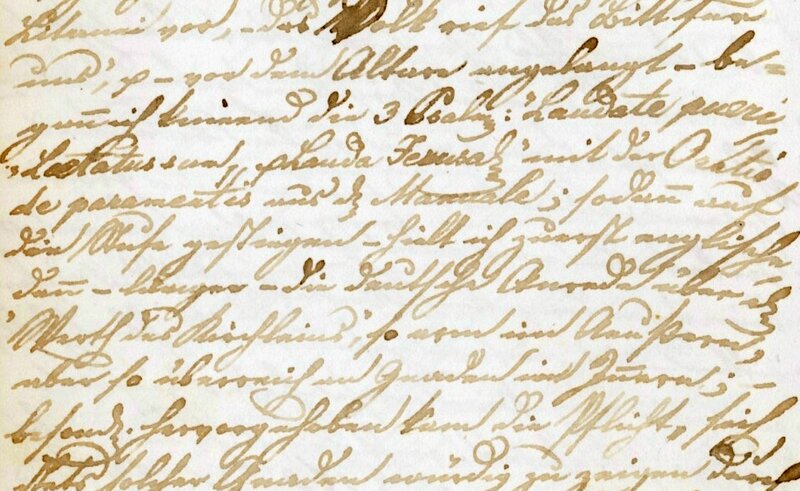 Father Maximilian Gaertner devoted nearly six pages in his journal to August 15, 1854, dedication day at St. Mary of Pine Bluff. On this page, Fr. Gaertner describes kneeling at the new altar and praying the Psalms. As the Catholic community in the region grew, Father Gaertner knew he needed more priests to minister to the flock. 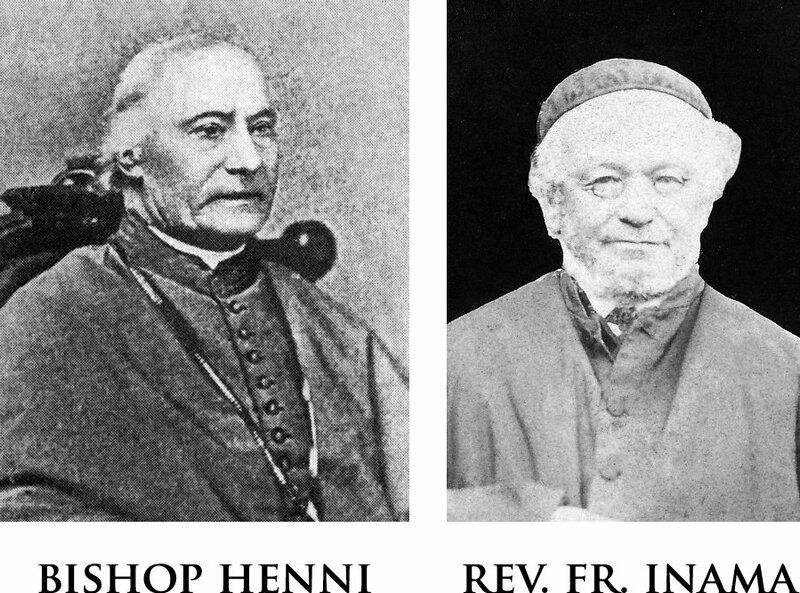 In October 1854, he went to Milwaukee to seek help from Bishop Henni. One of Henni’s newest priests was Laurentius Conrad, 25, who’d just arrived in America from Bavaria. Father Conrad was sent to Dane County, where he ministered to parishes in Pine Bluff, Cross Plains and Springfield. A parsonage was built in the village of Cross Plains. St. Mary of Pine Bluff and St. Martin of Tours in Springfield became mission churches for Father Conrad, who became resident pastor at St. Francis Xavier. Two of his younger sisters married into the Kalscheur family. Father Conrad’s father, Melchior, who initially farmed in Springfield before settling in Pine Bluff, is buried in the St. Mary cemetery. Over the next dozen years, St. Mary was served by five non-resident priests, including Fathers Sebastian Seif, Mathias Gernbauer, Wendelin Bernard, Anton Foeckler and Peter Voissem. In 1867, St. Mary got its first resident priest, Rev. Joseph Hamm. As the decade of the 1850s came to a close, the parish prepared to build a stone church to replace the log structure, which was lost to fire. The 50-by-30-foot building was erected at a cost of nearly $600. The new church building, along with a growing parish family, were strong signs that St. Mary of Pine Bluff was firmly embedded into the local landscape. What began as the dreams of pioneers from Ireland, Germany, Virginia and elsewhere was now the center of life for Catholics around Pine Bluff. And so it would continue to be. 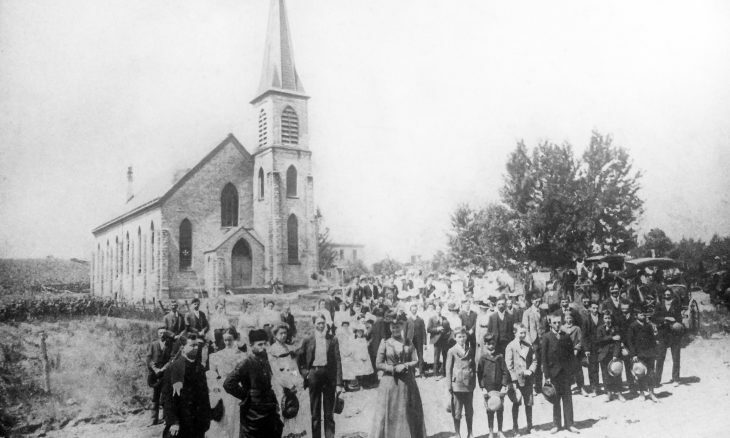 “The Immigration to Wisconsin,” History of the Catholic Church in Wisconsin, Rev. Leo Rummel, O.Praem., Knights of Columbus, Madison, Wisconsin, 1976. Rev. Peter Leo Johnson, Stuffed Saddlebags: The Life of Martin Kundig, Priest, 1805-1879, Milwaukee, Bruce Publishing Company, 1942. Madison, Dane County and Surrounding Towns, Wm. J. Park & Co., Madison, Wisconsin, 1877. 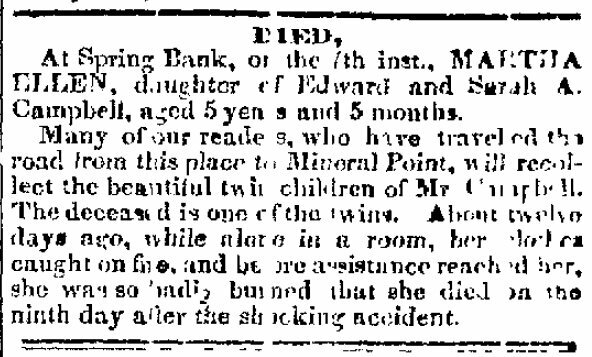 “Died,” Wisconsin Democrat, Madison, April 11, 1843, Page 3. “Letters of the Reverend Adelbert Inama, O.Praem,” The Wisconsin Magazine of History, The State Historical Society of Wisconsin, March 1928, Page 352. Pine Bluff: A Crossroads in Wisconsin, Bob Buege, Douglas Publications, Milwaukee, 2004. History of Dane County, Western Historical Association, Madison, Wisconsin, 1906. 125 Years: St. Mary’s Parish, Pine Bluff, WI, St. Mary of Pine Bluff Catholic Church, August 1979. “The Catholic Church,” Wisconsin State Journal, May 29, 1854, Page 3. “Prospects of Our Territory,” Wiskonsan Enquirer, Madison, February 16, 1843, Page 2. 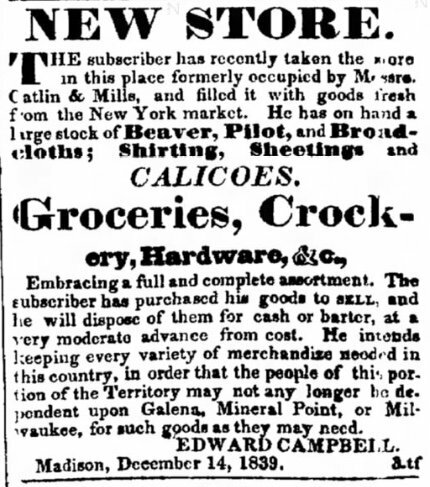 Madison Express, February 6, 1845, Page 3. Little Falls Herald (Little Falls, Minn.), July 24, 1908, Page 8. Photos of Michael and Maria Birrenkott courtesy of Kent Gebhard. Wisconsin Historical Society, Wisconsin Architecture and History Inventory, “John & Theresia Kalscheur House,” Town of Cross Plains, Dane County, Wisconsin, Reference Number 4794. “Inventory of the Roman Catholic St. Mary’s Church Pine Bluff,” document held in the church archives at Pine Bluff, Wisconsin. Gilmour, Steven C., Pioneer Settlers of Dane County Wisconsin: John and Mary (Lunny) Campbell and Their Descendants, Sparta, Wisconsin, Joy Reisinger, 1986.